The single most important site for the American punk and New Wave movements, CBGB helped start the careers of countless bands, including the Ramones, Blondie, Television, and the Talking Heads. Simultaneous to this creative outburst, the downtown New York arts scene was undergoing its own explosion through the development of new practices and alternative venues for exhibition. Presented in conjunction with the exhibition “Come Closer: Art Around the Bowery, 1969–1989,” this panel discussion explores the impact that CBGB and other downtown music venues had on creative activity in the neighborhood. Inspired by the bands, the crowds, and the set of contrasts presented by these clubs, artists developed projects that reflected this new energy. This panel discussion will reflect on the ways in which these two parallel developments informed and supported each other. John Holmstrom: During a career that has spanned nearly four decades, John Holmstrom’s work has appeared in a wide spectrum of venues, from underground publications such as Screw magazine and Comical Funnies to High Times and the covers of Ramones records. In 1976, Holmstrom and Legs McNeil cofounded Punk magazine, the premiere vehicle for examining the underground music scene in New York during the late 1970s. 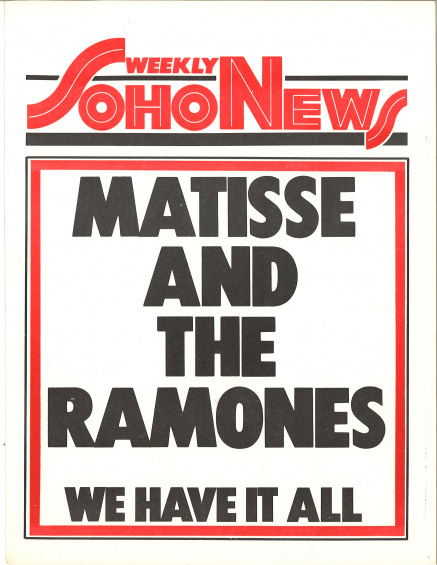 An anthology of Punk magazine, edited by Holmstrom, will be released this year. Pat Place: Pat Place has worked at the intersection of music and visual arts since her arrival in New York in 1975. As the original guitarist and one of the founding members of the Contortions, Place contributed to the creation and development of No Wave music. She went on to form the Bush Tetras. As a photographer, her work has been exhibited in countless galleries, most recently in the “No Wave, Post Punk, Underground New York 1976–80” exhibition curated by Thurston Moore and Byron Coley and her solo exhibition, “The End, 1981 – Infinity” at Thrust Projects in New York. Marcia Resnick: The photographs of Marcia Resnick examine the acts of seeing and remembering, and since 1973 her work has paid particular attention to the landscape, characters, and clamor of lower Manhattan. “Bad Boys,” a series begun in the mid-1970s, presents a series of portraits of her extended community, examining such enfants terribles as Johnny Thunders, William Burroughs, John Belushi, and Divine. A book of these photos, titled Bad Boys: Punks, Poets and Provocateurs, is forthcoming. Arturo Vega: Arturo Vega began his creative affair with rock ‘n’ roll in 1967, having spent the Summer of Love in San Francisco and performing musical theater in Mexico City. Vega relocated to New York in 1971, where he began painting and silkscreening. For twenty-two years, he acted as artistic director, guardian, and close friend to the Ramones, creating their logo, t-shirt, and stage designs. In November of 2012, a mid-career retrospective of Vega’s work will open in La Casa Redonda, the largest art museum in his hometown of Chihuahua, Mexico. Marc H. Miller, Moderator: Marc H. Miller is an artist, curator, journalist, and publisher who has been an active participant in the NYC art world since 1969. “Paparazzi Self-Portraits,” his collaboration with Bettie Ringma and Curt Hoppe, took CBGB as a primary site for exploring celebrity. In 1978, he co-curated the “Punk Art Exhibition” in Washington, DC—the first exhibition to begin to define the subject. In 2009, Miller launched the website 98bowery.com as a personal memoir of his time on the Lower East Side.